Trump mental illness off limts? You are here: Home » 2016 Elections » Is Trump Mental Health Social Media No-No? Is Trump Mental Health Social Media No-No? 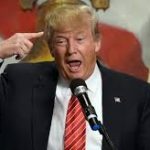 I recently posted a story making the case that Trump might have dementia. Very surprised John. When I first read this, I thought I was on the line at the grocery store. This is very “National Inquirer”. News Organizations and people acting as news organizations need to realize, sharing bad, unsubstantiated or fake news is just as bad as reporting yourself. You do not get off the hook because you are just sharing it. Very desperate. Walter is a long-time friend and colleague and I appreciate his comments. In fact, they hit home. I felt uncomfortable posting that piece. I even mentioned it in a recent column. Would I air that story if I was a TV news reporter? Probably not. I can remember when we weren’t allowed to do any stories, print or broadcast, on suicides. Who am I or that author to make a medical, psychological judgment from afar? By not having a documented medical opinion, isn’t this just a political witch hunt to harm this Administration? Those are the questions that Walter is raising and went through my mind as I re-read that story before posting. My final conclusion was, as I mentioned in the comment, I felt a responsibility to an open society to raise questions. I arrived at this: I don’t think a President’s mental health is out of bounds. Now, if it is used for purely political reasons and has no basis in fact, then there should be push-back or restraint. (I made the assessment that the article was not blatantly political, but could have been indirectly.) But if there is a clear national interest or danger, which a case could be made here, then I think it is fair game for discussion. Oddly, we seem to be OK with that conversation during the elections, but not after. Why is that? Many of you can take my judgment and forcefully argue against it. And many of you should hold me responsible if this story I posted is wrong or detrimental to the US. I can stand up to that – for the reasons I gave. And I have no political horse in the game. I am no Democrat or Republican. I want solutions. So, while I will gladly take the heat or criticism, I hope everybody will do the same. Sure, Walter and I have differing views of the news media which we have both been a part of, but I also think he is hitting on something else here. We all need a set of guidelines when we post. I will post mine soon. Should these guidelines be universal? Well, that would be great. But that is also impossible when you consider we all have our own ideas for fairness and our own biases – like different media organizations. One of my beliefs and goals is to get people to post and respond on social media with some journalistic principles: review and consider all sides; but post based on researched and confirmed facts; rid yourself of bias and emotion as much as you can; try to foster solutions for as many people as possible; and show love of mankind. However, let’s add in another factor. Social media is a new technology. Sure, it is the news media. But it is also our media. So, while I think we need to have journalistic principles underlying our posts, I also think expressing ourselves is allowable. I love reading perspectives that differ from mine. Sometimes it might change my ideas. I also love the full range of ideas on a topic. That’s what makes America tick. Next post: My Guidelines For Posting; What are yours?